> I knew all along that the NL MVP voters were going to get it wrong, but at least they didn’t push it too far. Buster Posey won the NL MVP today, something we’ve felt would happen ever since the regular season ended. I predicted him to win it, but, once again, that doesn’t mean I think it’s the right choice. The voting wasn’t at all close. Posey received 27 of the 32 possible votes, while Braun got just two. However, Braun got the most second place votes by a large margin, with his 15 votes being at least nine more than every other candidate. Posey finished with 422 points to Braun’s 285 (the next closest to Braun was McCutchen with 245). And Posey didn’t have Braun beat by too much in each of those stats, while Braun murdered him in most of the other stats. Plus, batting average hasn’t been, for some reason, considered as much of a factor because of the rise of sabermetrics (but until Carlos Pena wins an MVP with a sub-.200 batting average, I’m not buying it). Oh well. Not much else I can do to defend Braun, considering I attempted to defend him when Matt Kemp was in this position last year. 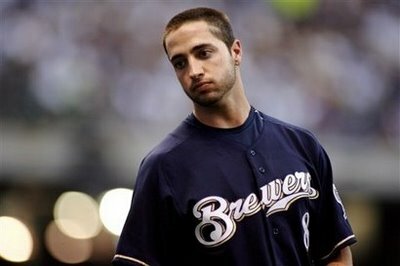 But, had it not been for the false PED accusation, Braun would have won the MVP- easily. > Meanwhile, Miguel Cabrera won the AL MVP over Mike Trout. Something told me I wanted him to win it, but I had a much tougher time defending his case than I thought. Perhaps it was because I actually opened my ears a bit more; most Cabrera-backers heard “TRIPLE CROWN!!! !” and nothing else. Braves: Signed Gerald Laird to a two-year deal. Cubs: Signed Dioner Navarro to a one-year deal. Blue Jays: Signed Neil Wagner to a minor league deal. Angels: Signed Billy Buckner, Luke Carlin, Brendan Harris, Trent Oeltjen, Jo-Jo Reyes, and J.B. Shuck to minor league deals. Nationals: Signed Will Rhymes to a minor league deal. Royals: Signed Brandon Wood to a minor league deal.